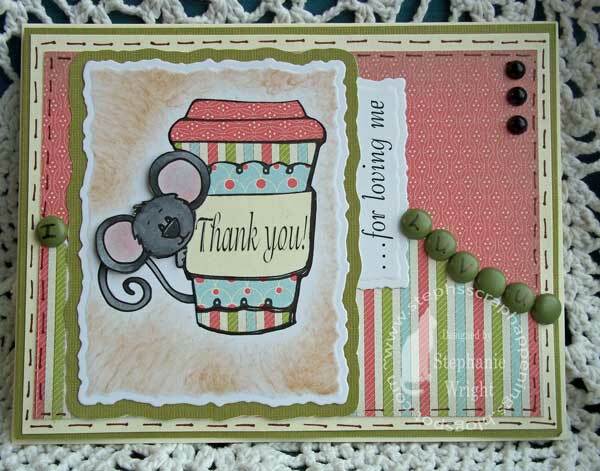 I have another Daydream Designs card to share with you today. When I saw the Jan. 23rd sketch challenge at Splitcoast Stampers (SC420), I knew I wanted to play along. Then I thought of the cute elements in the Sweet Warm Ups Color Digi Set and thought they'd be perfect for the sketch. This set also has several coordinating sets: Sweet Warm Ups Sentiments, Sweet Warm Ups Borders, Sweet Warm Ups (outline version), and Sweet Warm Ups Digi Paper Pack. I decorated the inside of the card a little but since I tend to be wordy (like you hadn't noticed -- ha! ), I left a lot of space for writing. Thanks for stopping by for a visit today. I hope you'll come back soon. Today I have a quick and easy project to share with you. It's a calendar that is sized to go easily in your purse or desk. The finished size is 3" x 6". 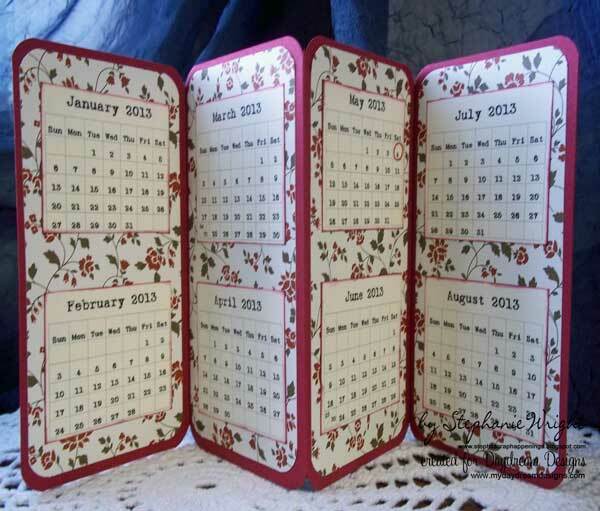 There is a calendar for each month and a place to write notes for 2014. All the digis are from Daydream Designs. Here's how I put my project together. Start with a sheet of cardstock 6" x 12" (I didn't have the color I wanted in 12 x 12 paper so I had to piece it from an 8.5 x 11 sheet) and score it every 3 inches along the 12" side. I rounded all the corners with my Round-it-All (this tool let me have the calendar closed and punched thru all layers with ease). 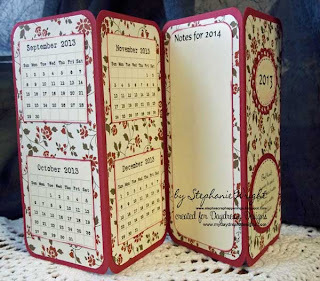 I layered each panel with patterned paper and rounded those corners as well. 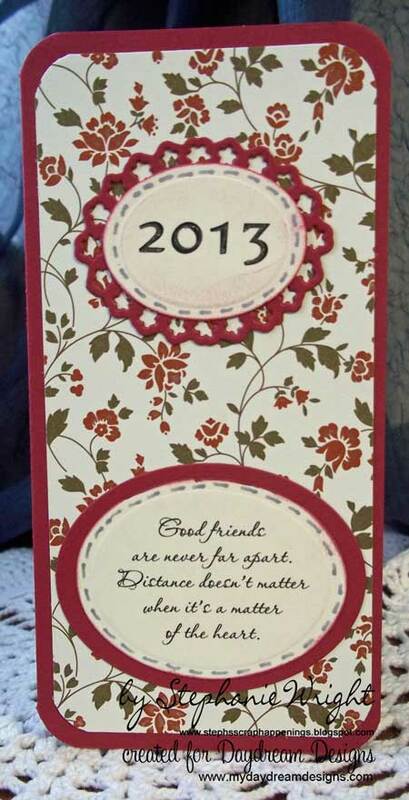 I printed one of the sentiments from the Friendship Collection Sentiments set and also printed out "2013" on cream cardstock. After cutting out and inking the edges, faux stitching was added; both panels were matted and adhered to the front panel. A glitter pen added some sparkle to the front cover. I didn't want to use any bumpy embellishments because I didn't want to add bulk and I didn't want them to get knocked off due to wear & tear during the year. 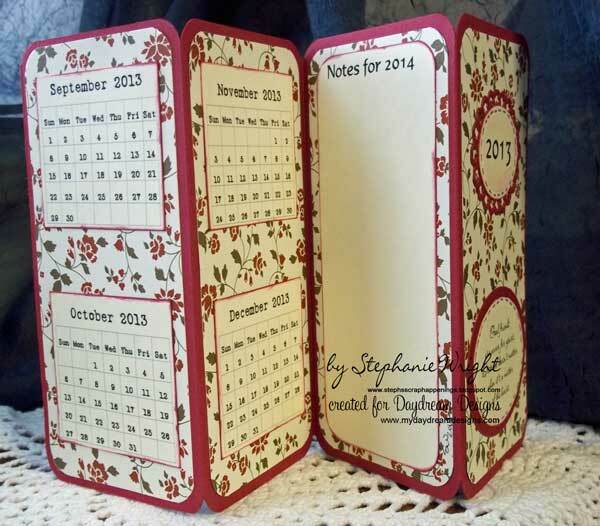 Why don't you give a purse calendar a try? They are so easy and made great gifts. Thanks for stopping by today and I hope you'll come back soon. I'll have a card using Daydream Designs pre-colored digis to show you in the next day or so. 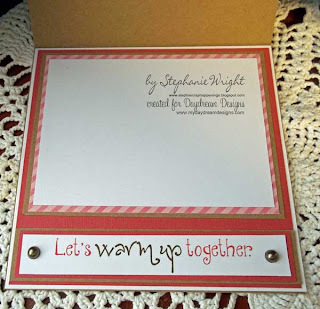 This week's challenge at the Sweet 'n Sassy Digi Challenge Blog is to use all white papers. They can be inked, embossed, distressed, etc., they just have to start out white. You image and embellishments may have as many colors as you'd like. I chose to use this sweet Rhubarb's Heart image and layered one of the sentiments from the All My Heart set in his heart. Love that about digis!! I colored Rhubarb and his heart with copics and cut him out and matted with nesties. I paper pierced the scallops for dimension. 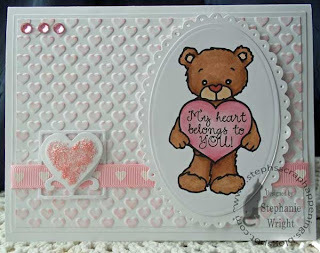 I layered two of the elements from the Decorative Photo Corners Spellbinders set and added stickles to the top heart. I threaded the ribbon thru the bottom of this embellishment. I have had this ribbon in my stash since early 2009. It may just be my oldest ribbon -- if it isn't, it's close to it. 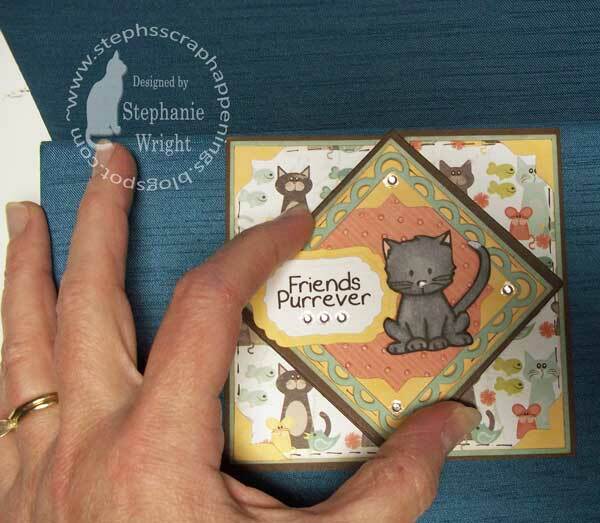 The background panel is embossed with a tiny hearts embossing folder. I used a Memento Dew Drop to add some color in a direct to paper technique. I really like the subtle pink color it added. This panel is matted on a solid white piece of cardstock and then glued to a white card base. 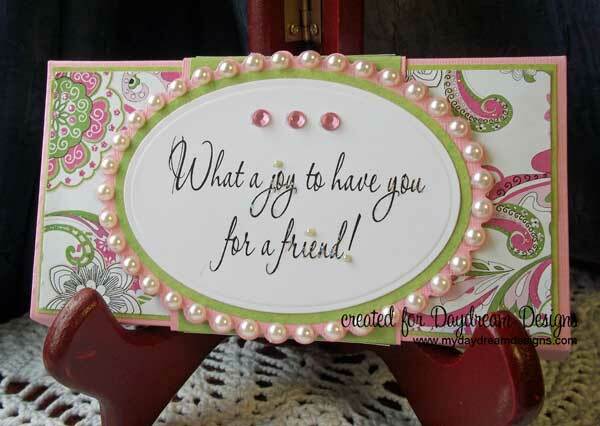 Three pink rhinestones finish off the card. Thanks for stopping by and visiting today. If it's as cold in your area as it is here, I hope you're able to stay inside and keep warm. 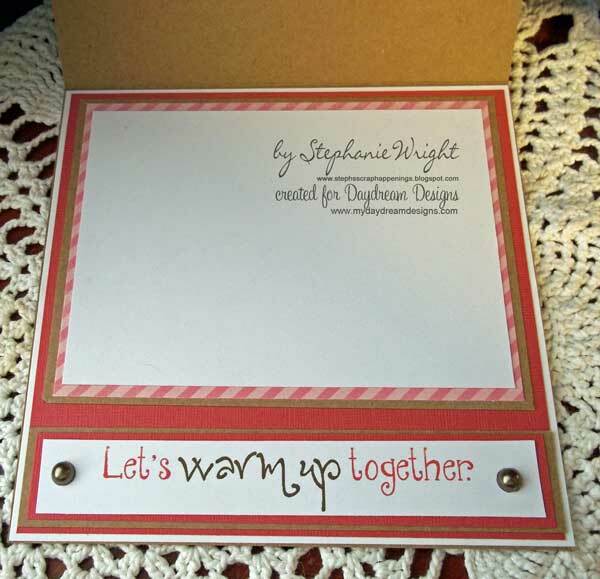 Today, I get to participate in my first ever Daydream Designs Blog Hop. You should have arrived here from Sandie's blog. 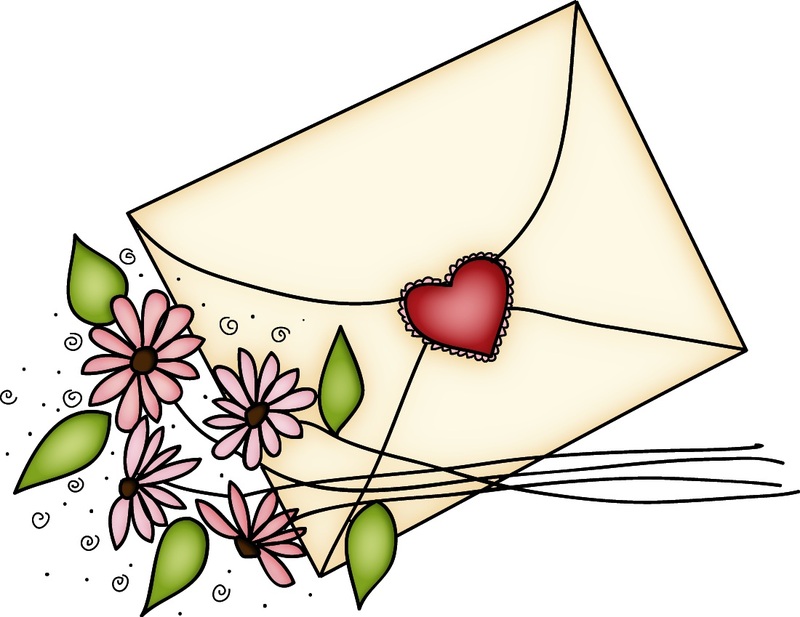 If you are a regular reader and started here, you'll want to go to Diane's blog to start at the beginning so that you don't miss a thing! In this hop, we are featuring the theme of HEARTS. There are LOTS of new Valentine's digis in the Daydream Designs store and actually, there are plenty that could be used year-round. After all, saying "I love you" is never out of season! 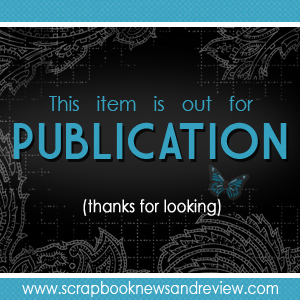 The blog hop will run from today (January 21st) until the 24th. Be sure to visit and comment on each blog in the hop. The prize for a randomly selected winner who leaves a comment on every participating blog is a $20 gift certificate to the Daydream Designs store. Keep reading to the end to find out about the FREE digis being given away during the hop. I have two heart-themed projects to share with you today. The first is a Valentine's Day card featuring 3 sets from the Snowbaby Love collection. I printed out the adorable puppy from the Snowbaby Love Color set and cut him out. I paper-pieced the heart from the Snowbaby Love Outline set and also cut it out. After cutting out the puppy & the heart, I ran a copic marker around the edge to darken it. I used one of the many sentiments in the Snowbaby Love Sentiments set and layered it in the negative space behind to oval cutouts. The patterned papers I chose have hearts all over them and to keep with the theme, I also used a heart embossing folder on the image panel. The image panel is popped up over the bling flourish and the puppy is popped up on the image panel. 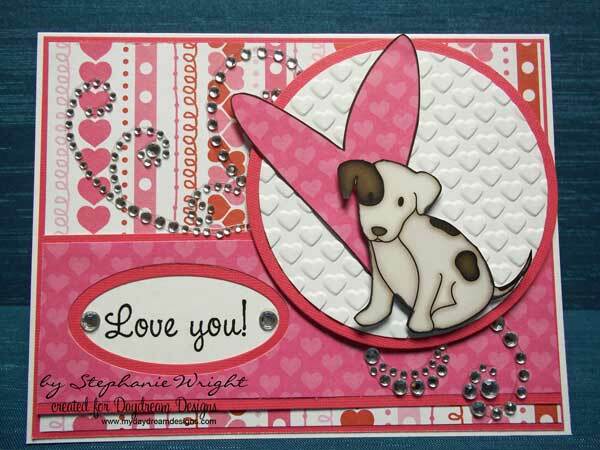 Two more rhinestones set off the sentiment and this simple but sparkly Valentine's Day card is complete. In this project I am also showcasing the Snowbaby Love Color and the Snowbaby Love Sentiment sets. I designed the calendar itself in Word. I layered the "Happy Valentine's Day" sentiment on the heart before printing. Love that about digis!! I printed several of the images in the color set and cut them out. They were then popped up on the on the calendar. 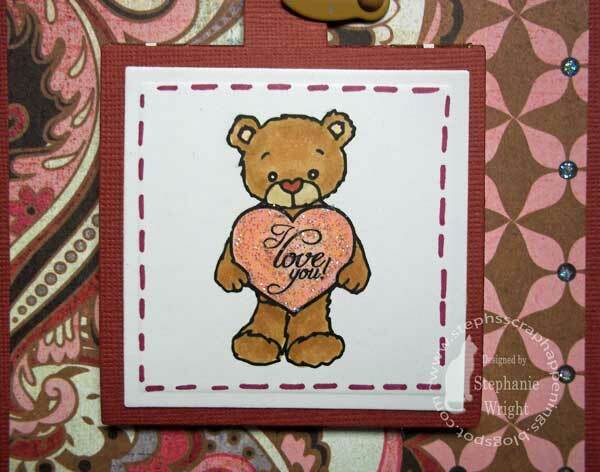 I used a heart shaped punch to make a border along the bottom and doodled in the negative space. 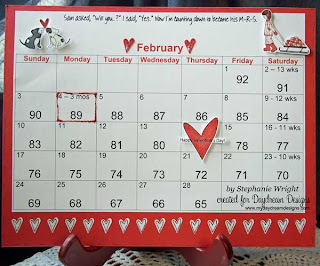 A couple of the cut outs were used to highlight "February." Stickles were added to all the cutout hearts along the bottom, the big heart on Valentine's Day, the two hearts highlighting "February", selected hearts on the sled and the puppies' heart. I also used red stickles to mark the "3 months to go" day. Now it's time to go back to hopping. Your next stop is Traci's blog. I'm including the full hop list below, just in case you get lost or can't do the entire hop at one time. Stephanie - You are here! As a thank you for visiting and hopping with us, here is a small gift for you - 2 FREE digis. Click on each one, then right click to save to your computer. Thanks for coming by today. I hope you'll come back soon. Happy Hopping!! Today is my mother-in-law's birthday so I thought I'd share the card I made for her with you. I made a criss-cross Card and embellished the front with one of the layered chipboard birds a friend recently gave me. My mother-in-law loves birds so I foresee using the birds my friend gave me on several cards for her. I used a metallic pen for the faux stitching. This gives a bit of shimmer as do the two flouishes. The ribbon also has a bit of shimmer to it and the flower has touches of glitter. 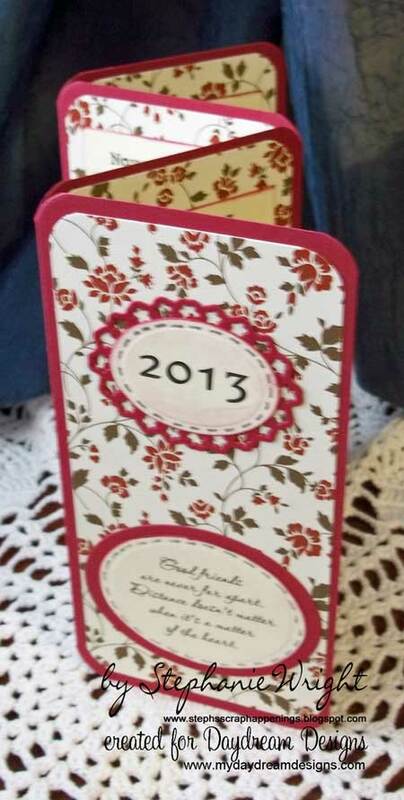 The scalloped panel pulls out and is where my husband wrote our birthday message to her. Thanks for stopping by today. 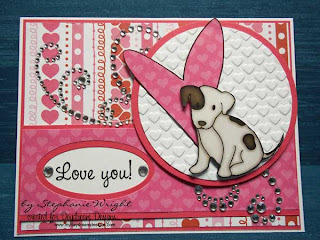 There's still time to enter the Design Team call over on the Sweet 'n Sassy Digi Challenge Blog. Visit the blog for full details on how to apply and on how to win the entire January Digi Release.. There is a lot of excitement at the Sweet 'n Sassy Digi Challenge Blog today. We have 2 new DT members, a new challenge and a new digi release!! Be sure to stop by the blog so you don't miss a thing. Also, be sure to stop by each of the DT members' blogs and leave a comment. One of the DT is our mystery blogger and one person who leaves a comments will be chosen at random to receive the entire January 2013 Digi Release. This week's challenge is Anything Goes. It couldn't be easier to participate. If you'd like to apply to join the Digi Design Team, there's still time. Just submit a project this week and write DT Call after your name. Easy Peasy!! 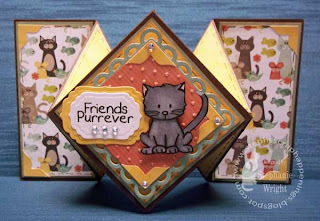 Full details are on the Sweet 'n Sassy Digi Challenge Blog. This month, the January 2013 Sweet 'n Sassy Stamps Digi Release includes 7 adorable "critters." Each one comes with one sentiment and costs $0.99!! What a bargain!! When I saw there was a kitty digi, I had to make something with it. As usual, I colored my kitty gray with my copics in honor of my Sasha. Unlike Sasha, I gave this kitty a white tip to her tail. I saw this Diamond Fold Card tutorial on YouTube recently and decided to give it a try. The tutorial was easy to follow and except for matting each of my pieces, I stayed pretty true to her instructions. I used a thick SU cardstock, this makes it a bit bulky. I might try a lighter cardstock next time. To keep the card closed, you have to hold it shut. It is a 4" square when closed. As you can tell there are lots of layers on my diamond panel. I popped up the lacey square panel off the background diamond and then also popped up the kitty. I added some rhinestones, embossed a panel and some faux stitching to add some details. Here's a view of the card from the top so that you can see some of the other folds. It looks complicated but it truly is easy to make. The downside of this card is having a place to write a message. 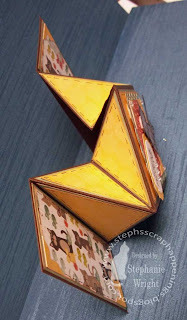 You could write it on the back of the side panels or get really creative and write it on the triangles (yellow on my card). Thanks for stopping by today and don't forget to leave a comment for your chance to win the entire January Digi Release. Be sure to stop by the rest of the DT blogs and leave your comment there too. I really enjoy making cards but I also enjoy other paper crafts. I've been wanting to make another tea bag wallet for awhile now. They are quick, easy and fun to put together. You can see my first one and a link to the tutorial on how to make your own in my blog post here. 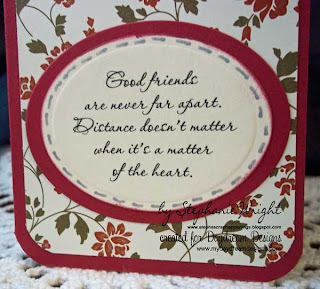 I love the Friendship Collection Sentiments at Daydream Designs. 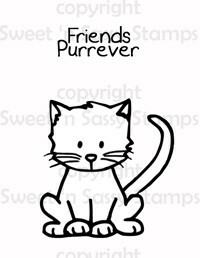 There are a total of 12 friend-themed sentiments in the set. I thought this one was perfect for the focal point of the top of this tea bag wallet. I put pearls on each scallop around the oval. I dotted the "j" in joy, the "i" in friend and the exclamation point with a tiny green pearl. 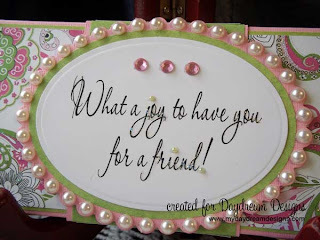 I used stickles to emphasize the words "joy," "you," and "friend." 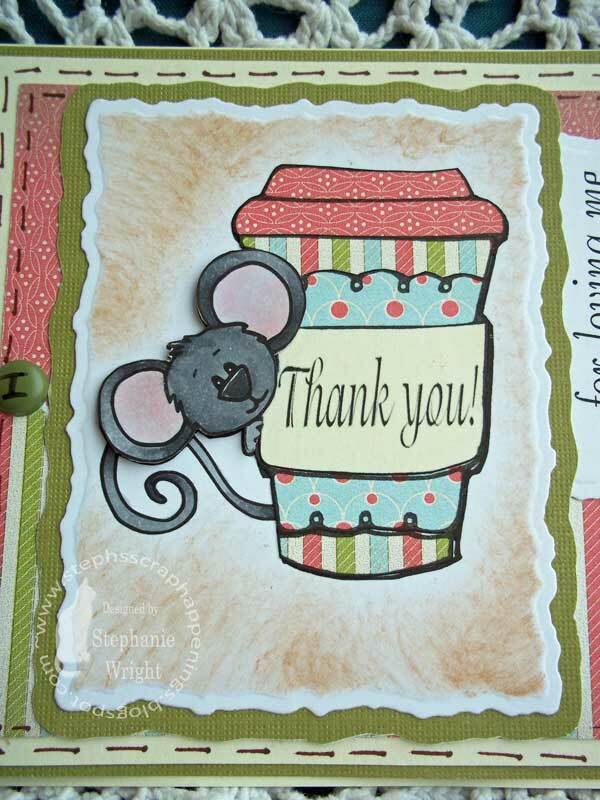 I also accented different parts of the patterned paper design with stickles. Three pink rhinestones finish off the sparkle & bling. 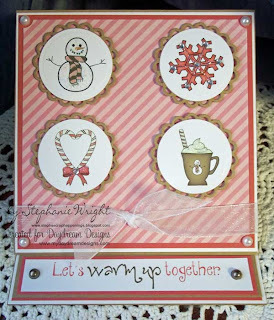 This week's challenge for the Sweet 'n Sassy Digi Challenge Blog is perfect for cold winter days. This week it's all about coffee, tea & hot chocolate images. There's also lots of excitement on the blog as two new DT members are being announced and there will be an open DT call for the next two weeks. Be sure to stop by the blog for all the details. I chose to paper piece the adorable Cocoa's Latte. I popped Cocoa's head up on dimensionals so that it looks like he's really peeking around the cup. 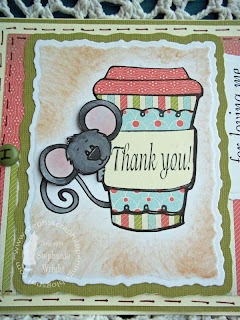 I added the Thank You sentiment from the Many Thanks sentiment set to the band on the cup. I generated the "...for loving me" sentiment on the computer. I used this week's Sweet Stop Sketch for the overall design. I wrote "I luv u" on the brads with a marker. Obviously, this card is for my hubby. :) Shhhh....don't tell, I haven't given it to him yet. 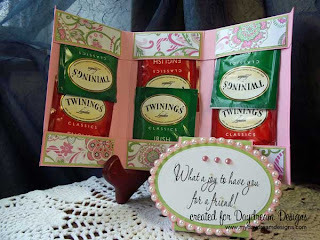 Don't forget to visit the Sweet 'n Sassy Digi Challenge Blog to read all the details on the DT call. Thanks for stopping by to visit today. You are appreciated!! It's time for the first challenge in 2013 for the Sweet 'n Sassy Digi Challenge Blog -- Something New. It can be a new product, new technique, new card design, anything as long as it's new to the crafter. For my card, I used a card design that I've never tried before....a Flip Down Stack Card. It's this week's tutorial at SCS. It was so much fun to make and the tutorial is fantastic! Here's a detail shot of the adorable Rhubarb holding a heart. With the wonder of digi stamps I layered the "I love you" from the Valentine's Day Greetings Digital Stamp Set on Rhubarb's heart. I used more of the sentiments in Valentine's Day Greetings and one from the Love Sentiments Digital Stamp Set on the flip down panels. Thanks for stopping by today and I hope you'll join us in using Something New. Happy New Year!! I hope this finds your year off to a good start and that 2013 will be a year of blessings for you. 2013 has some exciting things on the horizon for our family. Our daughter is planning a wedding in May. This means we'll be adding a son-in-law to the family. Actually, he already feels like part of the family so their wedding will just make it official. A new year feels like a clean slate and a good time for fresh beginnings. I have a couple things that I'd like to accomplish in 2013 but the main thing is that I'd like to draw closer to the Lord this year. There's nothing more important and if we find ourselves saying we're too busy to spend time with Him....well, then we're just too busy and we need to let something else go. Today, I'm sharing a digi card with you. It is my first project as an official member of the Daydream Designs Dream Team. I was so excited when Diane asked me to join the team. I really enjoyed my month as a Guest Designer and now I get to work with her fabulous designs all the time. 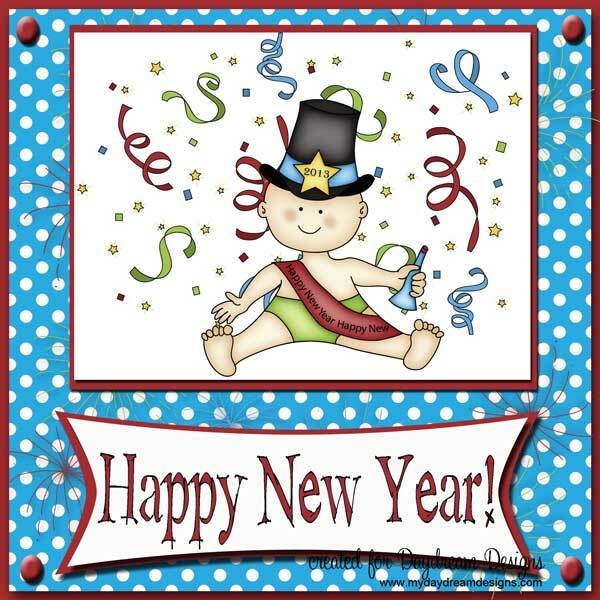 For my digi card I used the Happy New Year Paper Pack and the Happy New Year Color Digi Set. I used PSE to assemble my card and made my own brads, banner & matting. Happy New Year and may the Lord bless you and your family in this brand new year of 2013.